Members of the Phoenix Society who provide leadership. Done in the abstract cubism style. With an American flag in the background. Over the past few weeks I have provided some guidelines for those wishing to teach Historical European Martial Arts. This final week I want to wrap up my advice with a general overview of leadership styles. 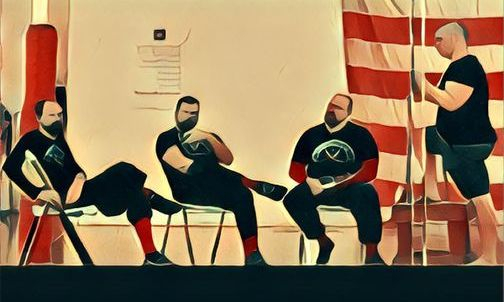 There are many ways to run a school or club and having traveled the world (no kidding) and meeting with HEMA instructors from every continent except Antarctica, I have a good idea of what is out there and the strengths and weaknesses of it. There are many roads to Rome and your own may follow one of the following paths. One of my many monikers is Tyrant. This actually comes from a series of science-fiction/comedy books I wrote where the main character is called a Tyrant, which later was attached to me for my particular habit of filling power vacuums in the HEMA Alliance and at my day job as High School teacher. The Tyranny I am discussing today is a governance style and one that is very common in the martial arts world. Tyranny in this case is not in the despotic sense, but rather when there is one ruler of a club and no one else. In this model of leadership the leader of the club (school, society etc.) is responsible for everything. They tend to have to teach, fight, manage and delegate. A club run this way is only as effective and efficient as the leader. The leader having to be and do all things, means even delegating may not cut it, because the leader has to manage that. Smaller groups can thrive under the Tyranny model and many of the five to ten man clubs I've seen, (both in HEMA and outside it) run under this model. Larger groups tend to suffer under this because there is simply too much for the leader to do. Like Napoleon at the height of his power, he could not be in Spain, Paris and Russia all at once. A series of small problems can overload the leader. Furthermore, Tyranny can lead to rebellion, when members of the group dislike the leadership style and decide to leave and go out their own or join another group. This story is so common that many of you reading this should be able to recall a martial arts group somewhere suffering a rebellion. Of all the leadership styles, I find this one the most common and there are some who are very successful at it, so don't be chased away by the notion of having a club run as a Tyranny. I was trained under one! The oligarchy is when a few key members of the club run the organization. It is similar to a Tyranny, but instead there is more than one ruler. My own club runs this way where ultimately all power is vested in John and I. There are other clubs in the USA run the same way, where two to three people control the organization, sometimes delegating core duties among themselves. The Oligarchy method has similar issues to the Tyrannical. The club is only as strong as its leaders and if they tire, the club tires, if they let things slip, then the club suffers for it. Delegation helps and in my club, John and I started off with a leadership team that advised us and we have transitioned to a larger team of leaders who can do everything John and I can do, to the point the club could, and has, run without us. Our end goal is to produce a steady stream of teachers and leaders who could run their own club should the need arise. The key to running an Oligarchy, I find, is to make sure those beneath the leaders of the club feel valued. Their input and needs should be taken into account and if possible rewarded. This reward may be as simple as giving them a voice in club decisions, or a leadership dinner, or some special hat, or shirt, etc. Delegation should be taken with care. Something I tell everyone in John and I's leadership structure is that if anyone feels put upon, to let me know. More than once, a task I delegated out, I took back, not as punishment, but to relieve the person of the duty because they felt it was too much, or they had a life-issue. I do this without acrimony and it has created a good collection of members willing to take on any task, and willing to tell me when they can't manage it anymore. The Oligarchs themselves have to get along, or the club will break. John and I get along fine, so I don't foresee any issues, but had we been very different people, the Phoenix Society would have become two Tyranny's a long time ago. Rebellion can be handled by actually being encouraging of the rebellious. If someone in your club wants to one day run their own, there should be no issue, so long as they don't set up shop next door. Be encouraging! In HEMA we are so small, the more clubs the better and I take pride in any of my birds that leave the nest. Remember, your students are in your club, not your cult. There are those who do run a cult and I strongly suggest not doing this unless you make it very public and interesting for the rest of us. Cults may appear like a Tyranny, but no decision, action, or thought is tolerated without the cult leader's approval. This form of governance is blessedly rare in HEMA, but common enough in the rest of the Martial Arts world and so it is best to take heed. If you are thinking of forming a cult, you can expect to deal with rebellion within and ostracizing from without. Since this is going to happen, and everyone is going to hate you, please pick out neat uniforms and introduce some rituals for the rest of us to admire. Go big or go home. 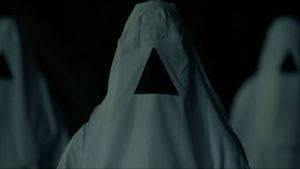 If you are student reading this, avoid a cult because your life will be one episode of drama to the next wrapped around the life of the cult-leader. If you are a leader reading this, be self-reflective to not become a cult leader. This form of government seems to be a great idea, at least from an idealistic point of view, but it has many problems. Democracy is a great form of government that repeatedly doesn't work. A thing to remember is that running a club is not running a civil government. The objectives are entirely different. Just like how the national army isn't run like a democracy, even though the government is democratic. In a club, a democracy means the power is vested in the hands of a few who vote among themselves. The four or so people who formed the club decide voting will solve their issues. The idea is, the group can vote its way to success. Over and over I see this is not the case because factionalism forms. Being told 'no' in a Tyranny and being told 'no' in a Democracy have different results. When someone is told no in a Tyranny, then they know what the answer is. When someone is told 'no' in a Democracy, that means they just need to get another vote to change it to 'yes'. Factionalism is part of Democracy and having it in a club will lead to inefficiency and acrimony. Furthermore, once you have a body of leaders who vote among themselves, the regular club membership will begin to wonder if they too can be added to the voting population. The more who vote, the more issues. If you are going to run a club this way, my advice is to have some form of written charter that guides the democratic body. The HEMA Alliance is in part run by a Governing Council elected from the population, and atop that a Board of Directors elected among themselves. Keeping this organization together is helped by our charter, which spells out what HEMAA is and in some cases what it is not.The HEMA Alliance works great as a service provider for its many hundreds of members and affiliates, but it would make a terrible way of governing a club. The HEMA community was once described as a loose association of lone wolves. This actually isn't true, most of the community fits into the Tyranny or Oligarchy formula. 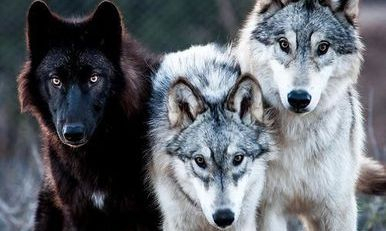 However, I have encountered large super-clubs that were run like a loose association of lone wolves. This form of government has numerous clubs under one banner and to be under that banner requires adherence to very little. This may be as simple as, "you must teach X" and "you must where this shirt". Some even have a leader, but that leader's power is limited due to geography, or the Loose Association's loose rules and loose structure. These Loose Associations are only as strong as their components. If a group of three people meet, train, and research regularly under the association, that's great! However, if three people meet rarely, and sometimes research and produce little, then not so great. Without strong leadership these forms of government really do rely on the interest level and energy of its members. Physical growth is easy (some of these associations span countries) because the barrier to entry is low, but growth as a martial art is not so easy. The prior forms of government can have curriculum, schedules, and some plan to produce quality students, while a Loose Association can't do that, only its self-starter members can. Furthermore, the components of the Loose Association can drift further and further away from what little ideals hold the organization together and there is no one there to say 'stop!'. For those casually into HEMA, the Loose Association is great, but if you want to run or lead a club, I would suggest avoiding this model unless you are entirely ok with its results. You can expect nothing except what the individual members decide to put in and rebellion within a Loose Association isn't one of members fleeing rules, but usually members fleeing to something with more rules or creating their own more strict form of governance. If you already run a club, school, organization, etc. then changing your structure right now, while not impossible, is hard. If your club structure has problems, try to identify it and find out what is YOU and what is result of the style of GOVERNANCE. If you are just thinking about forming your own club, or leaving one to create your own, consider now how you want your organization run. Remember the purpose of your organization and don't mix it with your political beliefs. I love dangerously free libertarian notions just about as much as I adore maniacal dystopians- I don't use either of them in running my club, because John and I aren't running a civil government. 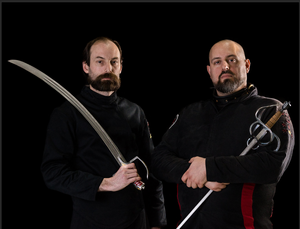 We're running a martial arts club whose goals are the teaching of HEMA and the promoting of our students. As can be imagined, the above styles of governments are broad strokes of the pen (or keyboard in this case), but they do cover the majority of what I have seen in the HEMA world including their strengths and weaknesses. No government is perfect, so pick the one that suits your personality best and be aware of that form of government's weakness. After every article I normally beg for you to buy a book. I have more coming out and so I'll hold off. Instead, there's a particular charity I would ask you to throw even a dollar toward called Streetlight USA. Streetlight USA takes abused girls out of dangerous situations and gives them a new home and education as well as counseling for their trauma. Each year, John runs a Phoenix Society charity tournament and we raised money for the shelter. You can help today! So, if you like my articles, buy a book, or, how about throw a few dollars to Streetlight USA.